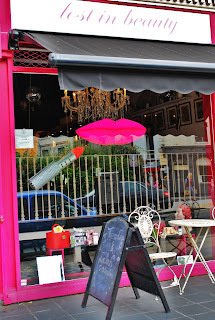 If you find yourself in London in the run up to Christmas, head to Primrose Hill's Lost in Beauty, a wonderful emporium for beauty junkies. 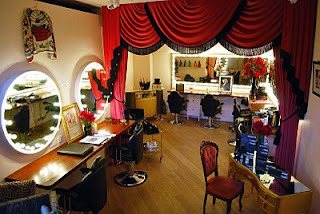 Downstairs is dedicated to unashamed old Hollywood glamour where beautifying services are on offer. 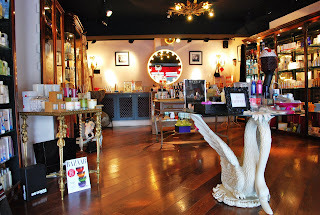 Heading upstairs, discover a selection of beauty products, gift sets, accessories and one-off vintage pieces. Along the unique theme, the team will even host bespoke parties or come to your home to help you prepare for an event. Perhaps most exciting of the one-offs is that Lost in Beauty will be hosting an exhibition selling signed paintings by one of my favourite London-based artists until 24th December. Fresh from her solo show at Liberty, Daisy de Villeneuve, who specialises in quirky, brightly coloured illustrations which have featured on products for the likes of Topshop, Moet and Habitat, has created one-off, beauty-themed paintings (POA) which make a wonderful gift for the beauty addict who has everything. If your wallet won't stretch quite as far as an original artwork, Daisy's personally developed candles will also be available. Trust me, this is a good opportunity to snap up her work...Daisy's designs feature on the forthcoming SS11 collection by Zac Posen so you'll be ahead of the fashion crowd. Great to see you loved Lost in Beauty, it's an amazing beauty emporium that not only stocks some great beauty products, Georgie also has a team of beauty and hair proffesionals which I love being part of the team.